I thought I'd start doing some more day to day entry type posts. I was also thinking a good theme might be a section on eating here because it is an adventure partly because the food is crazy, partly because I am limited to when I can go to the store because I don't have a car yet, and partly because I've had bigger closets than my kitchen here. So to work off that theme. Today we went to the grocery store. By we I mean Lindon's wife, 6 month old son, and Lindon's brother all of whom have about the same English vocabulary. Doing the shopping is not too bad. I have learned "Do you have..." and then I can usually fill in the last word via translator. But most of the fun comes from all the stuff I see in the stores I shop in and guessing what they will and won't have in the imported food section. Today I was looking for salsa to no avail. I haven't had Mexican food in about 3 weeks and as some of you know that is kind of a big deal for me. I had a craving that no amount of noodles or rice would satisfy. 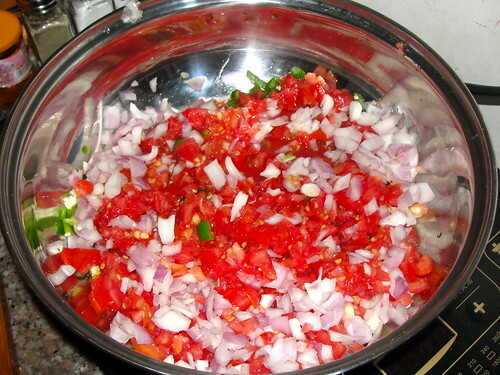 So I remembered, oh hey I know how to make salsa, I made gallons of it at the Ocean Mist in my time. So I decided I would. I took pictures partly because I was proud of it and partly because some people have been asking me what my apartment is like and I have been slacking on pictures. 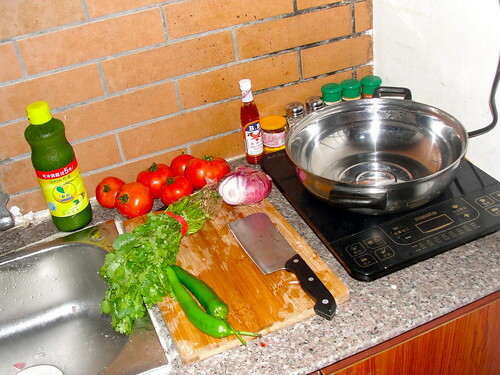 Here's what my kitchen and pre salsa making endeavors look like. As you can see, it's not much. There is about 4 in of counter on the other side of the sink. Cooking for more than one is a little tricky but I have only tried it once so it hasn't been much of a problem. These little babies made my eyes water a little. 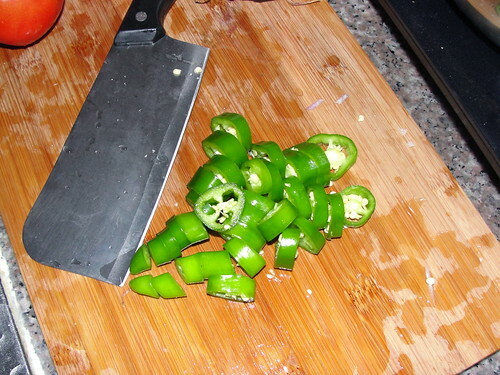 Here is the viggies chopped up. At this point I realized that some where a long the the line the lime I thought I bought didn't quite make it into my bag so I took my first venture down the street at night by my self which was fine. I went to a little fruit stand and bought a lime. Except when I got back to my apartment I realized it wasn't a lime it was some kind of little apple like thing the exact same shape, size, and color as a lime. Fortunately it only cost .50 RMB which is less than a dime. Now I have a new fruit to try. 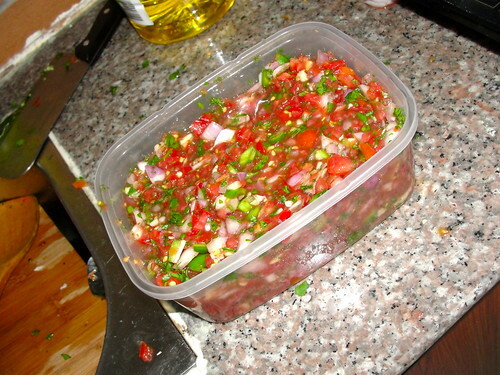 So the salsa is still lacking lime but here it is almost finished. Anyway, I am thinking for my next series of eating related posts I am going to bring my Camera to the super market and show everyone all they funky stuff there. Lindon's wife also coaxed me into trying some little fryable Chinese roll thingys (I don't know what we would call them in English just the Chinese name) If the production is interesting I may include it. that's so funny to me - tortillas but no sala. when I started reading your post I wondered what you were going to eat it on since I've not heard stories of you just eating it out of the dish with a spoon. No chips? Does China do Halloween? You could be Christian Bale in "American Psycho" with that cleaver you've got there. This is what I think of when I see your photos. Don't let those Sam's sit too long! I think if you can manage to find 2 Sam's i'm sure we can find you some more. No chips at the moment, Still looking. I cut up on of the tortillas and used fried it up to make a sort of chip. It wasn't too bad. Corn tortillas would have been better but beggars shouldn't be choosers. Cass, Halloween is more of a spectators holiday here. Kind of a lets all sit back and laugh as the westerners dress up and look like idiots kind of thing haha. I am super excited though, because I found a pumpkin! So Ill be carving that tonight. Maybe I'll post a picture.